When we accept Jesus we are each given a measure of faith. Faith to step out, faith to believe with all our heart that we truly are saved, but what's faithfulness? The Resolution for Women Book gives an excellent example, one exactly like the one my friend gave me about a year or so ago as I was about to make the biggest decision of my life! Lets think about a mother eagle. She's extremely protective of her babies, much like God is with us...exactly like He is with us. When we are new in our faith He's even more protective because we are just "babies" we can be swaded either way and He wants to keep us safe. As the baby eagles grow though, their mother becomes a little more lenient until finally one day she flips her nest to make the baby's environment very uncomfortable, much like God does, suddenly as we grow in our faith God asks us to do things for Him that is WAY out of our comfort zone and that's when it's all or nothing,that's when our faithfulness is tested...will we serve Him or will we run away and hide and deny His name. It's happened to me a few times, I've been lead to do things that I never thought I'd do, or that I could do. God has directed my steps, grown my faith and lead me places that are WAY out of my comfort zone. Thinking back on these things just blows my mind but it shows me how He's been teaching me to be faithful and He's been growing my faith. Faithfulness doesn't just happen over night, we're God's children so He continues to teach us a little at a time how to be faithful, when to be faithful and how faith plays a huge part. 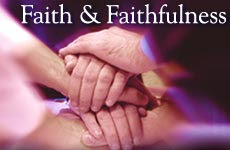 When we are completley surrendered, totally committed to the Father's plan...that's faithful. Being faithful is not easy, it's often looked down on...in a world full of constant competition against God, things pulling you in all direction it's hard to stay faithful but God is so patient with us and gentle in His guiding. Staying faithful is possible, do you want God's blessings on your life? Stay open to His plan and say yes when you're called...You are His and He will teach you to stay faithful. Mandy, thank you. There are times I have been there, I am thankful God is faithful as He has helped me through the times I have been weak, very weak. Your post is a great reminder, thanks again.